Here we are on the platform at the train station in Roskilde heading back to Copenhagen, with our bikes, on the train. She loves sitting on her Bulldog bike seat. Fortunately, not all days are rainy days. 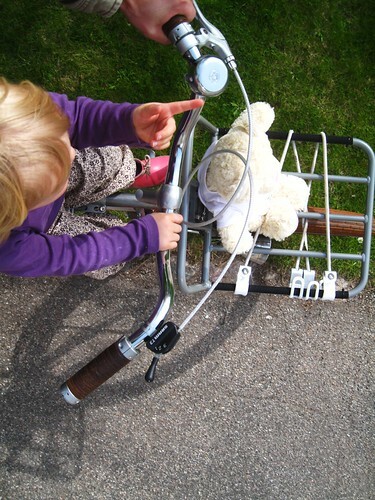 Here we have Lulu-Sophia and her bear, Wilma (go figure) enjoying the ride. 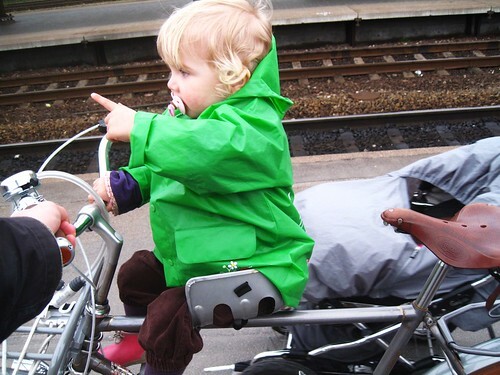 Very cute kids and a very irresistible rain jacket! Hey, the rain jacket picture is The Mole, see http://en.wikipedia.org/wiki/Mole_(Zdeněk_Miler_character) very popular cartoon here in Czech republic. Virtually every child knows who it is and has him in some form at home (pictures, toys). You can also check it out on youtube. Let me use this opportunity to tell you that I love your blog. I'm huge all-bicycle-stuff fan myself. Superb, vivid green jacket ! Must be related to Winnie the Pooh. Is that rust on your scrap deluxe? lovely child. you can be very proud. At the first picture,I never thought that it would be a baby. 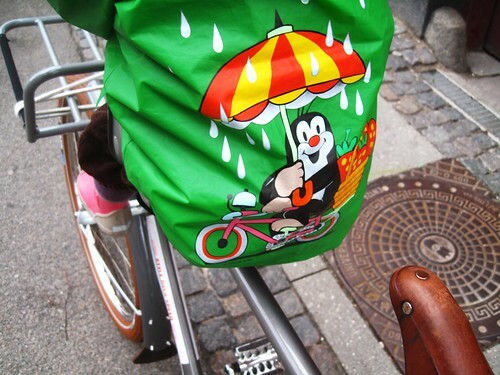 A very nice rain coats.Like it.My nephew would like this one. The rain coat is so cute.I love this. The kids and coats are adorable.Rain must be great in that place. can't see any rust. if you mean under the seat where the one tube is connected to the other tube, that's painted a gold colour.